All cat owners would agree: Post-pooping cleanup is the least desirable thing about having a feline friend at home. You have to deal with the bad odor, toxicity and bacteria as you scoop feces and scrub them off your walls and floors. This can also be dangerous if you have a kid at home. Thankfully, there are litter boxes particularly made for cats that can help you keep scattered poop at a minimum. Thus, it reduces the work you have to do. All litter boxes promise the same convenience; however, each one of them is made differently. In this review, you’ll get to know whether Modkat Litter Box is a good or bad option for your pet. If you only have limited space at home, Modkat Litter Box will suit your needs well. Owing to its small size and minimalist design, it can fit well in a cramped room. There are also five colors to choose from, making it easy to find something that can match your existing interior design. The scoop and reusable liner that comes with each Modkat Litter Box’s package further make poop cleaning easier. Thanks to the reusable liner, you don’t have to wash the bin every single day. In case you have to, it will not take much effort to remove the cover and clean up the bin thoroughly. The main function of the litter box’s lid is to prevent the odor from escaping it. This means you don’t have to spray disinfectants all the time your pet poops or pees. Aside from that, the lid is designed with multiple small holes. It serves like a mat for your kitty to step on and scratch off the remaining litter in its paws. Thus, it minimizes the possible litter tracks that you have to clean. With this litter box, you can spare yourself from buying a separate scoop and multiple bag liners. Emptying and re-cleaning your reusable liner may take a few minutes but it helps you save money and reduces the waste you have to toss out as a pet parent. Due to its small size, the Modkat Litter Box is not suitable for some medium-sized and all large-sized cats. They might find it hard, or even impossible, to enter through the narrow hole at the box’s lid. Aside from that, they might not be able to poop comfortably when their heads are sticking out of the hole and when their bodies are filling the entire bin. The litter box is relatively lightweight even with poop. Thus, it is easy to carry around. Nevertheless, it might still be a great help if it has handles on two sides. Modkat’s litter box is pretty much easy to use. Below is a step-by-step guide to help you prepare your cat for this product. Make sure all the parts are free from any damage. See if the lid fits snugly as well. Designate a spot where you want your cat to poop. It should not be in and near your kitchen. Place it away from any rags and carpets as well. Remove the lid and secure the reusable liner properly. When you are done, put the lid back. You have the option to hang the scoop’s handle on the litter box’s edge. However, due to the playful nature of cats, it is better to keep the said tool away from their sight. Don’t forget to train your pet on how to enter and get out of the litter box ​properly. It may take a few weeks before it can master the habit so be patient. A lot of customers rated Modkat Litter Box with 3 to 4 stars due to its narrow interior. For them, the only problem with the product was it size. While it’s not roomy, some of them noted that their pets were able to use the product even though they are medium-sized and around the 15 to 20-pound range. Many customers raved about the sleek design of the litter box which prompted them to give a 5-star rating for it. They said that the product didn’t look like it was made to hold poop. But the most important thing they admire about it was that it drastically reduced the litter tracks in their homes. 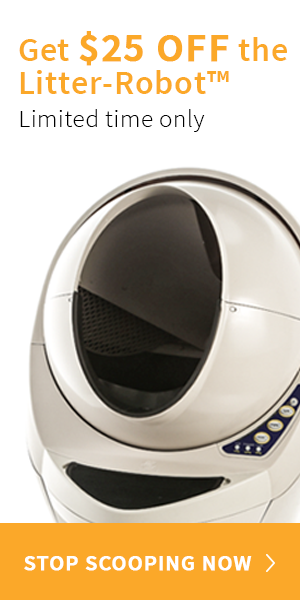 Modkat Litter Box may be small but it offers a lot of help in your post-pooping cleanup task. If you have a small cat, the said product will suit your feline well. With this litter box, you no longer have to stress about litter tracks on your walls, floors and even on your beloved furniture. You don’t have to buy additional tools as well. Previous articleWhy Is My Cat Drinking So Much Water ?